This home was built in 1920 and I lovingly remodeled it after the flood in 2008. 3 bedrooms, 2 bathrooms, wonderful front porch, full laundry facilities, living room, eat-in kitchen with a dishwasher - everything you need for your stay. Enjoy staying just blocks from New Bo & Czech Village (full of great shops and restaurants). It's easy to hop on the Cedar Valley Bike Trail, a trail head is in Czech Village. Hy-Vee (grocery store with a coffee shop and bank inside) is 1 block away. Downtown and the Double Tree Convention Center are 2 miles away. Just minutes from I-380. 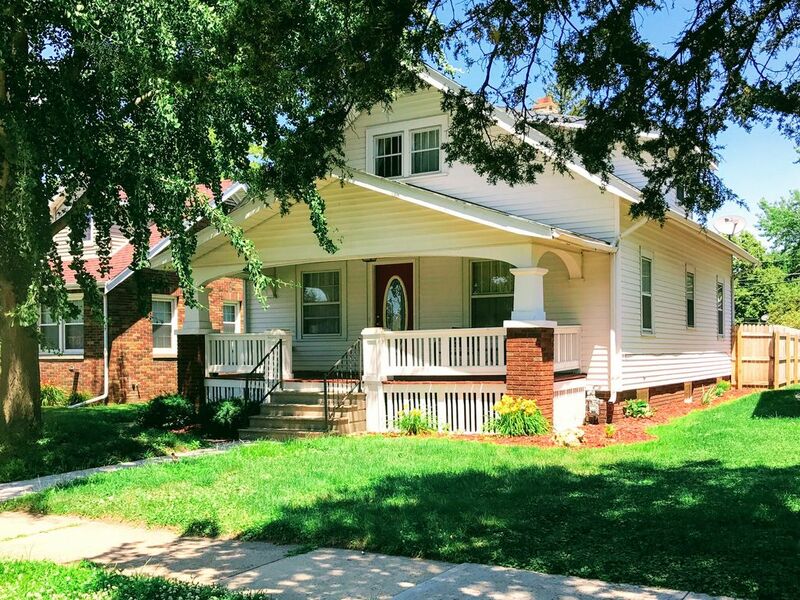 I hope you enjoy this almost 100 year old home, it is full of charm. There is a fenced in back yard for privacy or incase you are traveling with kids and pets. There is free parking on the street in front of the house. This is my husband and I, we live in Cedar Rapids. We enjoy traveling and have used VRBO for years. I hope to make this home as comfortable and easy to stay in as the homes I have visited. The main floor bathroom has a shower and separate bath tub. The upstairs bathroom is a half bath. You can park on both sides of the street in front of the home. Please ask about using, at times we store personal items here and don't allow it to be used. Large living room with a couch, three chairs, and TV with cable. Dish soap is under the sink, please don't leave dirty dishes behind and run the dishwasher before you leave. Already stocked with a few condiments if you would like to use them. Locally roasted coffee, creamer, and sugar are for your use! Plates, glasses, pots and pans are all in the home. You should find everything you need to make a meal. There is a smart TV in living room. A few board games and a deck of cards under the TV in the living room. Let me know if you are traveling with small kids, I can have some toys at the house for you. Back yard has a privacy fence all around it. There is a fire pit if you would like to bring wood to burn. A front porch and back patio with chairs and small tables. There are stairs at both entrances. Super clean and cute! Plenty of room. Great house that is well appointed with everything you need. Close to grocery store and Czech Village. Owner is super responsive and helpful. Great stay! This home was lovely. So well cared for and so nice and clean. Had every utensil and accoutre'ment one might need. We had a very busy weekend attending a wedding so did not spend alot of time at the house, but the grandkids really enjoyed it and got a kick out of the trundle beds. All the beds were quite comfortable. Lori is a great host. Was so kind to provide helpful local information such as restaurants and grocery stores in the area; really helpful. Would definitely recommend and will return should we need a place again in Cedar Rapids. The bungalow was everything our group of 6 needed. Room for everyone to sleep and stretch out in the main room. The kitchen had everything we needed. The neighborhood is super quiet and we like the fenced in back yard. Would definitely stay again. This home was very cozy. It let our family enjoy a Thanksgiving meal in a home away from home. We would recommend this to anyone. Spacious home, great accommodations, wonderful location! We had a great weekend stay in Cedar Rapids. This home is well maintained and beautifully decorated. We brought our dog and had no issues finding great things to do in town close to the location. The house is cozy and inviting. It was perfect for a gathering of old friends. This was so much better than a hotel for sharing meals and catching up with one another. Everyone was very pleased.